Star Trek: The Next Generation will be celebrating its 25th anniversary in 2012, but the fans are the ones who will be receiving a gift. As has been heavily rumored for months now, StarTrek.com has confirmed that The Next Generation will indeed be coming to Blu-ray in 2012, and it will be arriving in style. 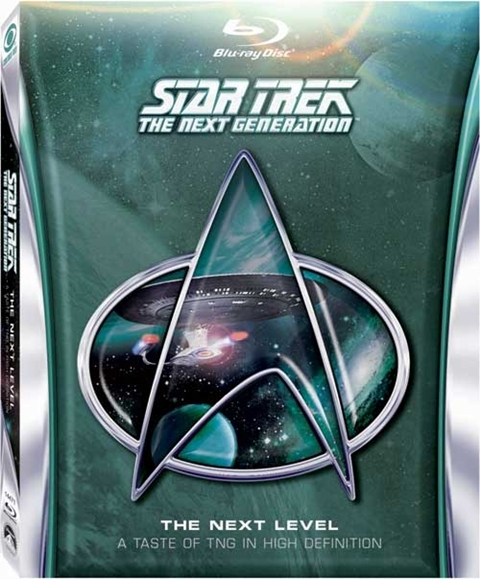 Fans will be able to get their hands on a four-episode sampler disc entitled Star Trek: The Next Generation – The Next Level on January 31st, 2012. As previously reported, the sampler disc will include the show’s two-part pilot, “Encounter at Farpoint,” as well as “Sins of the Father” from season three and “The Inner Light” from season five. In addition to an official release date, we also have cover art (check it out below) and a price: The Next Level will list for $21.99. Of course, four measly episodes isn’t that much to get excited about. Thankfully, StarTrek.com’s story also confirms that the full run of the show will follow on Blu-ray later, with at least season one arriving in 2012. The Next Level sampler disc is more a proof of concept and a chance for skeptical fans to see if the show’s high-def upgrade is worth a new purchase. I imagine since the show’s full release is coming, most fan’s will skip the sampler disc and just wait for the full-season sets. One of the biggest questions since the Blu-ray Next Gen upgrade became a talking point was the question of how the show’s special effects sequences would carry over. Since the show was shot on film but finished on video, there was concern that we might wind up with something similar to the Babylon 5 DVD releases, which suffered from similar problems of outdated special effects that weren’t easily upgraded to current technology. Thankfully, Trek has never been a franchise that was afraid to throw money at a problem. Not only has CBS Entertainment created new 1080p, 7.1 DTS masters of the episodes, but they’re apparently redoing the special effects as well. As CBS Entertainment Executive Vice President and General Manager Ken Ross explains, “Transferring the series to high-definition presented difficult technical challenges, but our team has come up with a process to create true 1080p HD masters with true HD visual effects.” The process was also supervised by consultants and longtime Trek icons Michael and Denise Okuda. It’s great news for Trek fans and has the potential to be an amazing upgrade for a classic show. Stay tuned to Cinema Blend for more info as we get it, and in the meantime be sure to head over to StarTrek.com to check out a short video teaser for the release.